This is the Take Your Haven With You Weekender Bag. It is a super stylish, oversized tote printed with a trendy eucalyptus design over a blush pink background. It would be perfect for your weekend at the beach or out in town so you can take your haven with you wherever you go. The wide-mouthed, durable bag holds a generous amount of your personal items and is easily held by its thick rope handles. The specially spun polyester fabric is designed to retain its shape and wont wrinkle. -Length - 25", Height, 13", Depth - 6"
-Before cleaning the bag, remove all the items from bag. I suggest you pre-treat visible stains with stain remover. Mix warm water with laundry detergent and clean the bag with terry washcloth or soft bristle brush. Let the bag air dry. 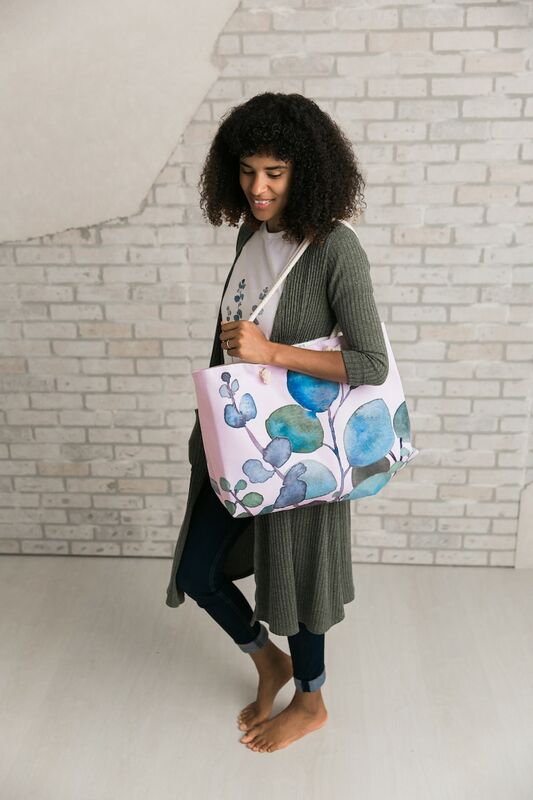 -This bag has a unique, hand painted watercolor design, designed by me, Jillian Anderson. While I designed and painted the eucalyptus, it is printed with ink using a sublimation printer by my production partner through Printify. They will print your bag and send it right to your door! -You will receive one bag shipped in self sealing poly mailers with high adhesive seal strip and UV protecting coating inside. Packages are tightly secured providing excellent protection during shipments.